Ah, Nero, second only to Caligula, or perhaps, thanks to Hollywood, Commodus, among the Roman Emperors we love to hate. Why, he fiddled while Rome burned. Well, not really, since fiddles as such were a long way from being invented yet. 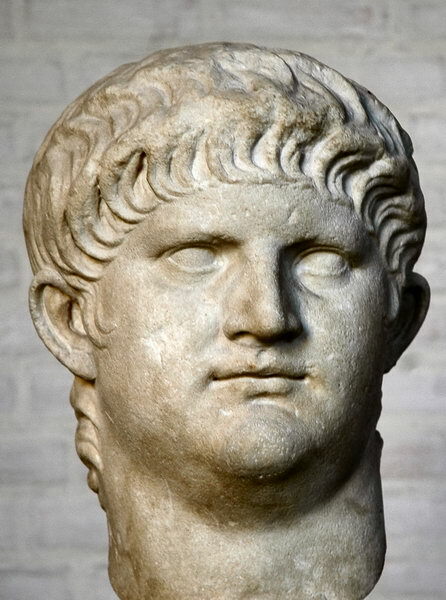 There was a rumor, though, perhaps started by Cassius Dio, certainly fueled by Seutonius, that when Rome caught fire and burned to the ground in 64CE, Nero climbed the Palatine Hill and “…sang the whole of the Sack of Ilion in his regular stage costume,” the aforementioned piece apparently being a long, theatrical declamation he had written (just for the occasion?). What? Regular stage costume? Well, you have to understand the man. Nero fancied himself a first class poet and playwright, a brilliant actor and dramatist, and, need I add, a superbly gifted athlete. It was rumored that when he ordered his slave to kill him after he was driven from Rome by angry mobs and a smattering of generals, lacking the balls to do it himself, his dying words were “The world is losing a great genius!” or something to that effect. He instituted regular festivals featuring contests of poetry, drama and music, which he himself inevitably entered, and just as inevitably won, since none of the judges fancied their chances if they declared for someone else. This timorousness of judges extended to his athletic prowess as well. He once entered the Quadriga, a four horse chariot race, and the most prestigious of the races in the favorite athletic event in all of Rome, with a special chariot fitted with twelve, count ’em, twelve horses. The judges conferred, and ruled that it was legal, having noted, I suppose, that twelve was a multiple of four, after all. To be fair, he was leading into the turn-about (who would pass him? ), but tipped over, surviving a horrible crash unscathed. And victorious. Those astute judges noted sagely that, well, he would have won, had he not tipped over, and awarded him the trophy. In defense of the judges, it should be noted that more than one general lost his job, rank, and occasionally life, just for falling asleep during one of Nero’s poetry recitals. So, the burning question (sigh) is, did or did not the man diddle, if not fiddle, while Rome burned? It seems as though, if he did, he still had time to handle the situation honorably enough. Tacitus wrote that he took in refugees from the fire at his own residence, and fed and clothed them, opening the substantial palace grounds to anyone in need. So, if there was a fiddle, it was figurative, and much deeper, and here we get to the subject of who or what started the fire in the first place. Fires in Rome were commonplace. Just beyond the familiar temples and palaces of stone and brick, the city was a ramshackle jumble of rickety wooden structures. Truthfully, even in the more substantial stone buildings, fire was a danger; remember, before electricity, heat and light were provided by fire. The ubiquitous lamps used all over the city and beyond consisted of an open bowl filled with oil. A wick was added, and the whole thing, when lit, provided ample opportunity for spillage and subsequent disaster. Stone and brick were, all the same, filled with furniture, carpets, draperies – in short, fuel. In the poorer quarters outside the central district, fires were so common and so dangerous that indoor cooking was forbidden. More than one emperor capped his hallmark forum with a firewall against the slums next door. Still, this particular fire had started suddenly, in an unusual place, and spread like, well, wildfire. In the end, only a bit more than one fourth of the city escaped unscathed, with much of the central district destroyed completely. And there’s the rub. Nero had this area cleared, and built a fabulous new palace compound, the Domus Aurea, on the site. It had a lake big enough to stage recreations of famous naval battles, and a statue of himself, as Sol Invictus, stood 30 meters (about 100 feet to us colonials) at the head of the grounds. It was called the Colossus, and gave its name to the Coliseum that replaced his palace (a whole other story). The name Domus Aurea refers to the centerpiece of this garden of splendor, the residence, with its dome covered with gold. The dome was engineered to rotate, and the night sky was painted on the interior for the bemusement of dinner guests, who were sprayed with perfume and showered with petals on entrance. True, other emperors before and after built lavish homes for themselves, but this particular effort sorely rankled, because Nero used public money to build it, on the grounds that it was essentially a city renovation project. Truth to tell, there was precious little difference between public and private money where public officials were concerned, but each had its own pocket, and the populace cherished the fiction that they were separate. Far from using public funds for their personal projects, high officials, and especially the emperor, were expected to spend their own money on public projects, as a show of magnanimity. The lavish Domus Aurea was a step too far, and it fueled rumors that Nero himself had set the fire, to rid himself of senate rivals, and clear the land. To be fair, Nero had his own theory, and that was that Christians had set the fire in a sort of apocalyptic fervor. The result was a very public campaign of persecution, leading, among other things, to the particularly venomous description of Rome in the Book of Revelations, generally supposed to have been written 30 years or so after the great fire, but could have been earlier. Well, to a lot of the Roman public, that seemed pretty likely, or at least plausible. Nobody who wasn’t a Christian liked them very much. They refused to honor the other gods of Rome, they hung around with slaves and other low-life, and they met in secret, where it was rumored that they partook of cannibalistic rituals. If the fire wasn’t set by Christians, most people were content to let them get persecuted all the same. Even some modern scholars believe that the idea of Christians starting the fire is not entirely out of the question.They got a lot of propaganda mileage out of the persecution, and laid the groundwork for expansion. Even so, it is the consensus now, as it was then, that it was either accidental, or set by Nero’s agents. But whether or not Nero was at fault, he certainly benefited from it, at least in the short term. He silenced most of his senatorial critics, and he got his magnificent residence in the middle of downtown Rome. If there was a fiddle involved, that was it.